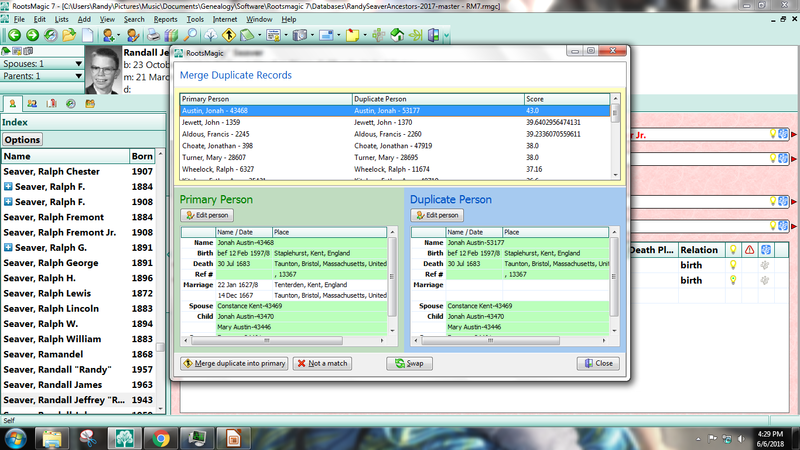 In the ten years that I have been using RootsMagic, and attending most of the CGSSD/SDGS RootsMagic Users Group meetings, I had never used the "Duplicate Search Merge" tool. Perhaps because I had never really considered that I could have added duplicate persons to my family tree, I implicitly knew that I probably had duplicate persons. This tool helped me find twenty (yes, 20) of them, but not all of them were duplicates. Some of them were two children of the same name born to the same parents with different birth or christening dates and/or places (which aren't actually duplicates). So I've started using this tool, and I wanted to share with my readers, and other RootsMagic users, how this tool works. I clicked on the radio buttons that seemed to be sensible to me. I may go back and click on more buttons after I've gone through this list. 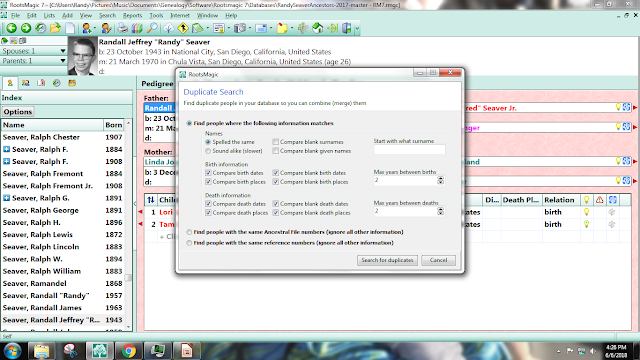 Each potential duplicate shows a primary person on the left and a duplicate person on the right, with a "Score" that seems to indicate how much of a duplicate the two persons are. 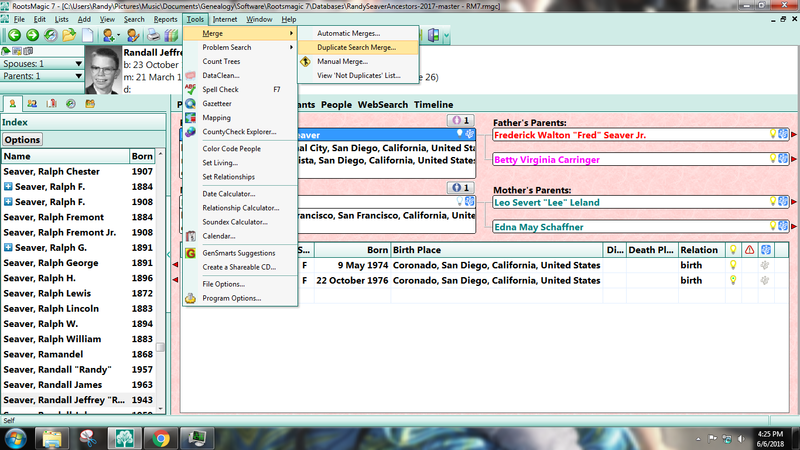 On the screen above, with Jonah Austin highlighted, these two profiles in my tree have the same birth and death information, same two spouses and children (indicated by the green background and identical profile Reference numbers), but one profile did not have the marriage dates and places. This is an obvious duplicate entry. 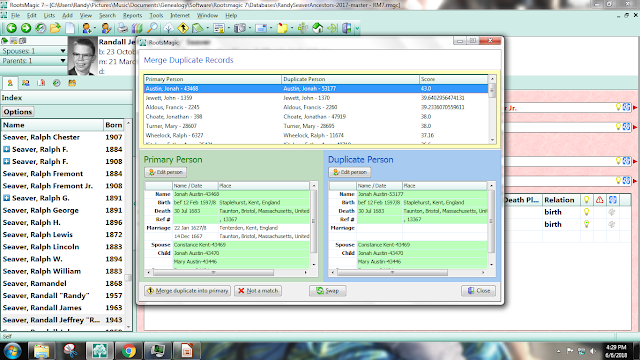 4) I chose to "Merge duplicate into primary" and the name disappeared off of the "Merge Duplicate Records" list. 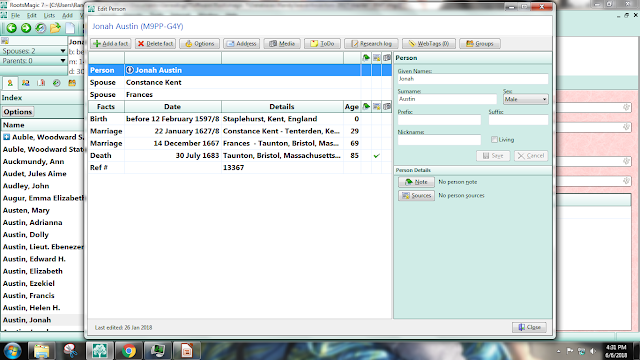 There seem to be no duplicate events for this person, but I see that I need to add sources for the birth/baptism and the two marriages. 5) I checked to see if there is a Report to find duplicate persons, and there is the Reports > Print a Report menu and it includes a "Duplicate List." I'm sure that I've used this before! That used the same "Duplicate Search" form as above, and found the same set of duplicates as the "Merge Duplicate Records" screen above, but took a lot longer to do it. 6) Now that I have gone through my twenty potential duplicate persons, my 50,000 person RootsMagic family tree is a little slimmer. 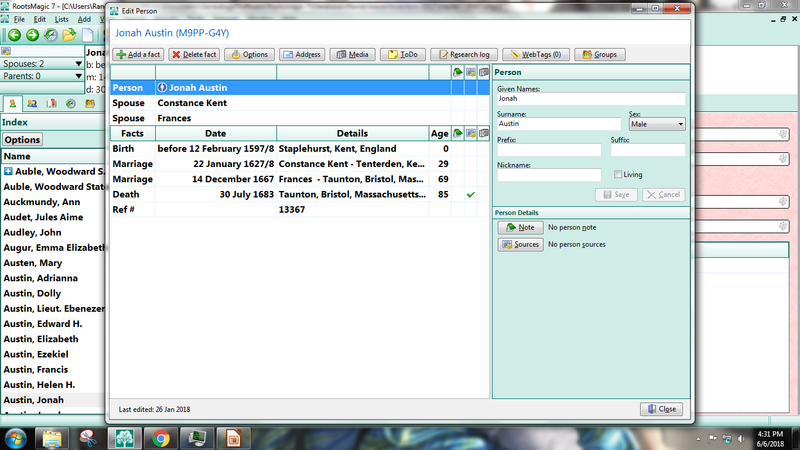 Now I need to remove the duplicates from my TreeShared Ancestry Member Tree. That's a bit harder to do. As always, I really appreciate your RM7 tips. Will have to try this one because I’m sure Ihave dupes. Aye, Randy ROX. 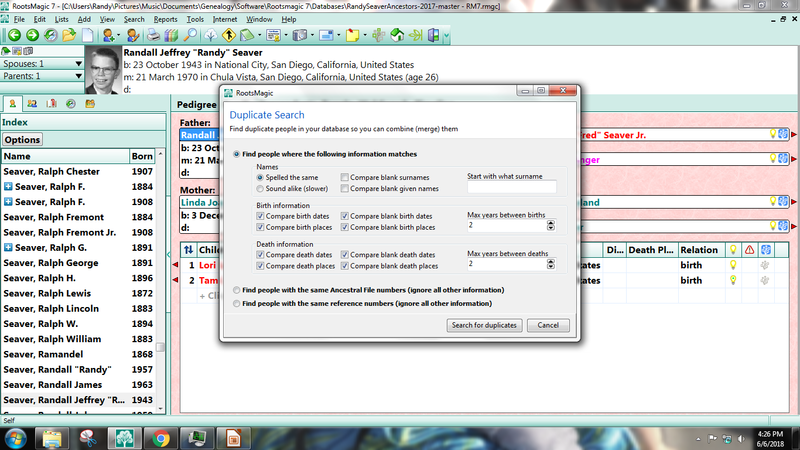 Adding duplicates is a symptom of adding individuals whilst using different sources. I do this and expect others do it, too. Before adding, I now verify that I do not have the individual under consideration.